Rising political uncertainty overshadowed the company's full-year 2016 earnings announcement. 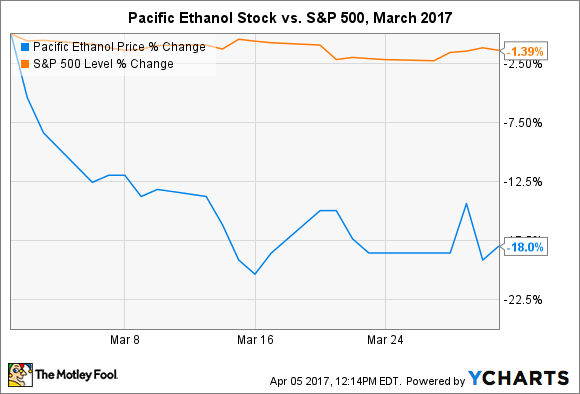 Despite announcing impressive fourth-quarter and full-year 2016 earnings in the beginning of March, shares of Pacific Ethanol (NASDAQ:PEIX) tumbled 18% last month after a series of political events spooked investors. A slew of bills were introduced in the House of Representatives that called for capping the amount of ethanol blended into gasoline at 10% (instead of rising to 15% as the ethanol industry proposes), keeping mandated ethanol production levels at current volumes, or even completing eliminating the Renewable Fuel Standard, or RFS, that mandates biofuel production and blending volumes. Adding fuel to the fire were revelations that billionaire investor Carl Icahn, an advisor to President Trump and owner of independent refiner CVR Refining, has lobbied to significantly weaken or scrap the RFS. While the bills have not progressed and would face steep opposition from representatives in Corn Belt states on both sides of the aisle, the market's reaction to the developments is understandable considering the RFS has been instrumental in creating and nurturing the world's leading ethanol industry for the last 12 years. Unfortunately, the political uncertainty overshadowed impressive performance from Pacific Ethanol. The nation's sixth-largest ethanol producer reported record production for the year and a come-from-behind fourth quarter profit of $0.30 per share that allowed the company to report EPS of $0.00 for the full year, compared to full-year per-share loss $0.60 in 2015. It completed a crucial debt restructuring that will reduce annual interest expenses by $8 million and implemented several cost-cutting measures across its production fleet that will save an additional $10 million (or more) per year in operating expenses. That's a big deal for investors, considering $18 million is the equivalent of $0.41 per share. But improving performance and the increasing strength of nation's ethanol industry weren't enough to outrun concerns over a series of bill proposals from the 115th Congress, which began on Jan. 3. "The bill would freeze renewable fuel blending requirements under the RFS at 7.5 billion gallons per year, prohibit the sale of gasoline containing more than 10% ethanol, and revoke the EPA's approval of E15 blends." "The bill would require the EPA and National Academies of Sciences to conduct a study on 'the implications of the use' of ethanol gasoline blends containing 10-20% ethanol by volume." The bill would limit the use of cellulosic biofuel required under the current RFS. The bill would cap the ethanol blend rate at 10%. The bill would fully repeal the RFS. Some of the bills are likely nothing more than political stunts, but others could gain traction, especially with support from the refining industry and key advisors in the new administration. They aren't all bad for the ethanol industry, however. For example, studying the effects of higher ethanol gasoline blend rates could actually provide additional support for expanding the American ethanol industry, depending on the results. Past studies have shown that 15% ethanol blend rates are feasible, which would boost the amount of ethanol blended into the nation's gasoline supply by 50% overnight. Of course, even in a worst-case scenario, it's important to remember two things. First, Pacific Ethanol is a major seller to the California market, which offers its own generous subsidies and incentives independent from federal tax credits. That won't change if the RFS ceases to exist. Second, the American ethanol industry has been a net exporter since September 2013. In fact, it averaged over 100 million gallons of ethanol exports for the final four months of 2016. Growing international demand could help offset any potential declines in domestic consumption, and playing up the importance of exports could prove valuable in the current political environment. Pacific Ethanol is no stranger to volatility. It has a history of positively responding to factors that it can't control -- and 2017 should be a record year for performance. While the sudden increase in political uncertainty is not welcome news for investors, concerns appear to be overblown. The company is well-positioned to capitalize on regional and international trends in the industry.